#155* – Few In EUkip KNOW How Close To Being BROTHERS They Were! THEY COULD HAVE SO EASILY BEAN BROTHERS: Few will have noticed Nigel’s uncanny resemblance to our dearly beloved ‘National Treasure’ Mr. Bean? His bumbling attempts to lead UKIP are clearly modelled on his famous alter ego! 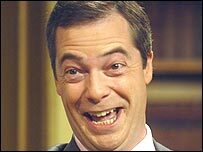 It is hardly surprising that Nigel Farage was pleased to find I and other friends believed his brother would be an inappropriate front man – Never did I believe that Farage would be foolish enought to believe he should lead either. I’m with Christopher Booker & Bill Jamieson there His brother would have been as bad as Farage has turned out but for other reasons.